We have stated on several times that we are not praise singers. We exist to offer checks and balances, to analyse events and expose public ills. You know where to find praise singers. They even praise when they are not paid. Straight to the point. Edgar Lungu made Cabinet rotations two days ago but what are the salient points? After Felix Mutati was made to fall from Grace, or as one person puts it, ‘like an Army Commander being demoted to a Council Police sergeant’. 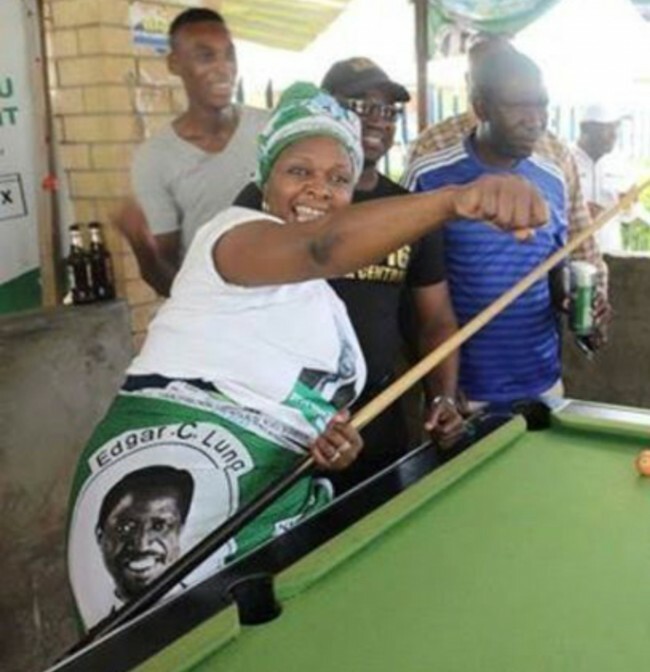 Lungu had to find a way of not offending his god Father Rupiah Banda. Lungu had to replace Mutati with another MMD member. Yes people may say Margaret Mwanakatwe stood on PF ticket but thuth be told;?Mwanakatwe is MMD. She is actually reported to have been Rupiah Banda’s Girlfriend at one time. So for the PF goons who may have celebrated the exit of MMD at Finance, forget. It’s exit MMD enter MMD. This also shows that Edgar Lungu still believes that PF is intellectually bankrupt to have someone to run Finance. The question is can Mrs. Mwanakatwe perform at Finance? was she morally the right person?. We do not want to pick up a quarell with women NGOs who support anything female even when it is a disaster, no wonder no one takes them seriously anymore and donors are reluctant to fund them, but here are little facts. In serious countries, Margaret Mwanakatwe not have been Minister or MP. Margaret Mwanakatwe as a government official borrowed money from the Citizen Economic Empowerment through her company called Aluworks. To date she has not paid back. She was not even supposed to be Minister of Commerce because CEEC falls under the Ministry of Commerce. Secondly, this is a lady who gets drunk and loses her handbag in a night club whole dancing with boys young enough to be her grandchildren. Should she be in charge of the National Purse? Margaret was fired by Barclays Bank in Ghana. Why? Aiding money launderers In addition to poor performance. Probably this is the time Lungu regretted firing Lucky Mulusa. May be he could have made a better choice. PROMOTION OF DR. MARTINE MTONGA. Yesterday when he made rotations to Permanent Secretaries, Lungu promoted Smart Zambia National Coordinator Dr. Martine Mtonga to the position of Deputy Secretary to the Cabinet Level. Why Dr. Mtonga and who is Dr. Mtonga? Martine Mtonga is one of Rupiah Banda’s most trusted trustees. He is Rupiah Banda’s speech writer. He is actually the one who drafted the agreement between Edgar Lungu and Rupiah Banda in 2015 after the death of Michael Sata. Others says RB loves Martine more than some of his own Children. He is second to Henry. Dr. Mtonga as National Coordinator of Smart Zambia was sworn in as equivalent to a Permanent Secretary just like the coordinator at DMMU. For those who may not know, Smart Zambia duties also include what that old Dinosaur called Dickson Chasaya the Public Service Commission chairperson said: Spying on Civil servants in offices. Lungu also, where did he exhume such skeletons? Anyway we know its that tribalists Alexandra Chikwanda who recommended. Back to Dr. Mtonga. Lungu promoted Dr. Mtonga as a stop gap measure in case RB was very annoyed with the demotion of Mutati. This means that we now have nine Deputy Secretaries to the Cabinet. When the economy was performing slightly well under MMD, we only had one. Yes nine. Martine Mtonga, Secretary to the Treasury Fredson Yamba, Deputy Secretary to Cabinet Finance Christopher Mvunga, Deputy Secretary to the Cabinet Administation Patrick Kangwa and Principal Private Secretary at State House at State House Dr. Simon Miti. All Presidential Aides are at the level of deputy secretary to the Cabinet and these are Amos Chanda, Kaizer Zulu, Legal Advisor Sukwana Lukangaba and Economic Advisor Hibeene Mwiinga. Soon we may have more deputy secretaries to cabinet than Permanent Secretaries whom they supervise. Shame. This is one of the reasons why IMF and the World Bank has been asking for reforms. They claim more than sixty percent of locally generated revenue goes to renumeration. As for Dr. Mtonga we hear there is already an issue of procurement of over priced computers under smart Zambia. We hope they were not supplied by his former employers Mutech Computers owned by Rhidah Mungomba and his wife Marble the young sister to Mr. Nkandu Luo, the Minister of Higher Education. Maybe they were supplied by Henry Banda. Anyway we will know soon. As for Kampamba Mulenga, a former Tasintha escapee, we say you showed and proved both moral and intellectuall bankrupcy at the Ministry of Information. Now you will be counting fish from Edgar Lungu’s Fish ponds at State Lodge. Careful though. Do not drown ask George Mpombo to teach you how to swim. To be continued.